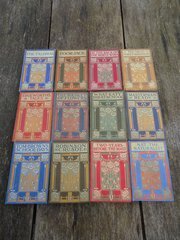 Set of twelve Arts & Crafts children's books with covers designed by Ethel Larcombe(1876 -1940) who worked on a freelance basis for Talwin Morris. These were published by Blackie and Sons limited. Many of these bear inscriptions as a school prize. The books measure 18cms x 13cms. The condition is not so good with some wear to covers and stains to pages but they make a great display in any Arts & Crafts bookstand. 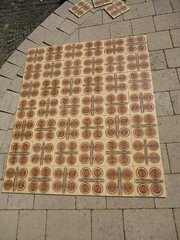 Set of 42 unused Retro 1970's Spanish wall tiles with a slightly blurred abstract pattern. These are almost perfect. 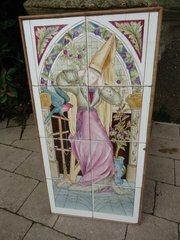 One image shows an additional five tiles with very minor nips to corners. They measure 6 inches square and quarter of an inch deep. 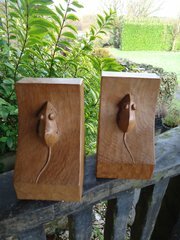 These were made for the British market. Made by Villarreal in Castellon, Spain. Unusual Arts & Crafts wool work panel of a lake side scene of a small cottage and trees, probably Scottish. 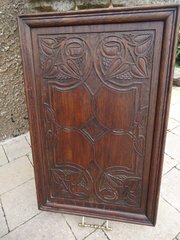 Offered in good original condition with just a few loose threads to bottom right hand corner. 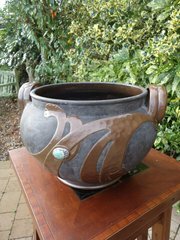 This measure 90cms x 52cms. 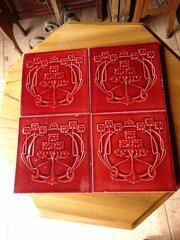 Set of Four maroon Arts & Crafts tiles in the Secessionist style with raised stylised flowers. Offered in good condition but with a few nibbles as shown. Measuring 6 inches square. Impressed England and reg number to reverse starting 433394 The image in the darker images portray the correct colour. 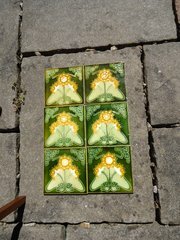 Attractive set of six Arts & Crafts floral tiles. Offered in good condition with just minor nibbles to some edges. They measure six inches square. This price includes postage within the U.K.